It’s a bit of an emotional roller-coaster. My egg pickup on Saturday went well – I had 11 eggs – yay! I was over the moon. I turned up for my embryo transfer this morning to find that only two eggs had made it as far as four-celled embryos. Devastated. Well, those two champions were transferred by my very nice doctor and are now inside me. I was so shocked by the news that I couldn’t even hang around and speak to him about what happened. I almost fled out of the consulting room when he was finished, holding back tears. It was such a revolting feeling to walk out via the waiting room where plenty of other women were eagerly anticipating their transfers, and of course, I held my red eyes low as I assumed they would look at me wondering why I was bothering in the first place … at my age. I can’t help but think that if nine of my eggs were so bad then why should these two that I’ve got inside me limp along any further than about eight cells. The truth is that I’ve left it too late. My good eggs have just about run out. So much for the birth control pill. So much for the high hormone dose. So much for the acupuncture. Aargh. I have my Border Collie at my feet whilst typing this. 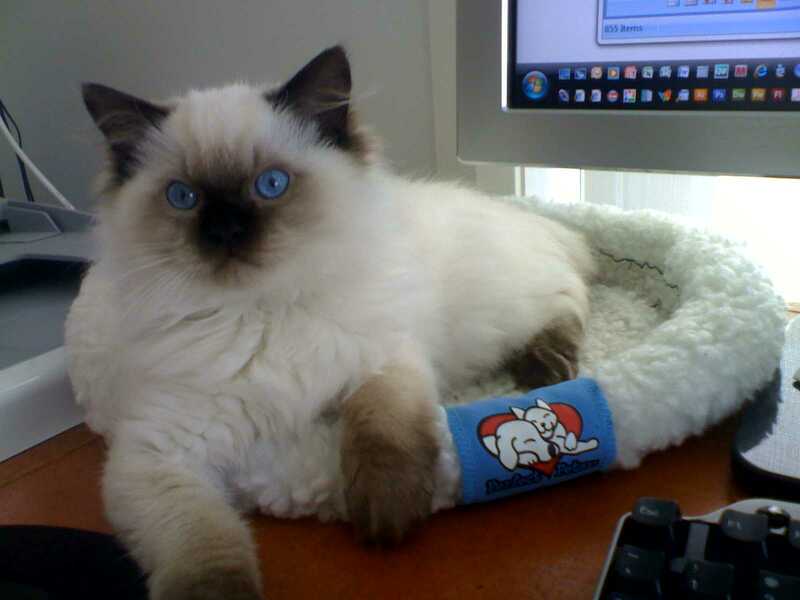 The kitten is on my desk hitting the buttons with me – very difficult to type straight :). The bright side is that I have two embryos inside me. I have hope, a wonderfully supportive husband (the first thing he said was “Well, if this doesn’t work honey we can try again straight away”), and I have prayers. I promise my next post will be happy and positive. Like I said earlier … this will be my month! Ha ha! The kitten got too inquisitive about the Border Collie sleeping under the desk and FELL OFF the edge of the desk ONTO HIM! What a calamity! Here are our two pets! William is the ever-responsible, insanely jealous dog and Tabatha is the new kitten who just wants to make friends. We love them to bits! 13 Responses to "The Ups and the Downs"
Hard to be upbeat sometimes eh? Feel the same way today. Really down. . Cute furbabies tho! I am mad at mine presently. At hubby too! Ugh. You have no obligation to be upbeat, just be what you are. I’m sorry it was such a letdown. We have had them too. I’m glad for your wonderful husband. It’s so hard when you have expectations so I’m sorry only 2 embies made it to day 2. Hoping that is all you need and it is your turn. 2 embies is ok. i know the disappointment is huge but…… ok I’ll not even go there but you’re still in there. Really. It has happened before. As for the pets, I wanted to hear it was incredibly easy to get your 7 year old Border Collie to accept the new kitten. My collie is a big jealous lad, he’s going to hate his new sister (only 2 weeks to wait), I just know it! Happy days! As “they” say – you only need one. So 2 is good right? I do understand the disappointment of not having many, that was my main problem. Remember that the evil hormones are screwing with your mind. I was so down, tearful and depressed on all of those drugs. Be kind to yourself. As you said – this is your month!! 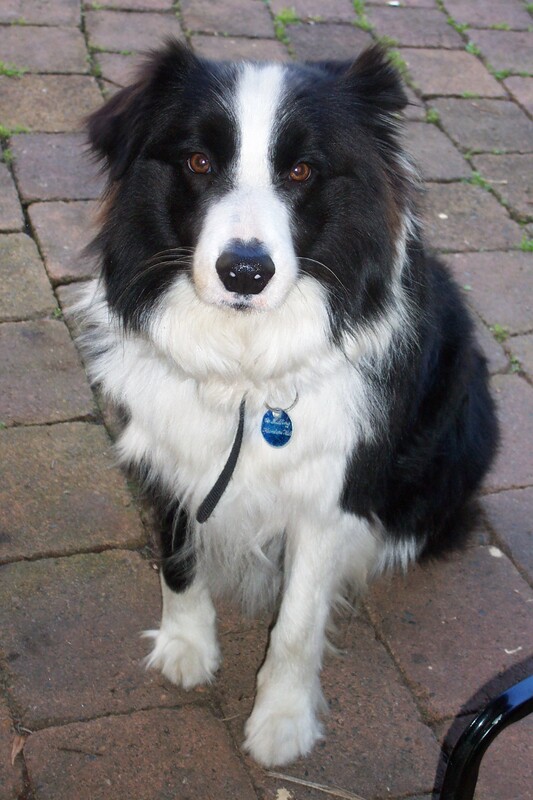 That is one good looking Border Collie!! And Tabatha is adorable!! Hang in there, you’re still in the game. And two is two is two. No telling what they’ll do now they’re back in the five-star hotel that is you. Good things may happen. And Sharon is right! Those stupid hormones make it all so much worse. Last cycle I spent fervently wishing they could just put me in a medically-induced coma from retrieval through the 2ww. Bleah! We’re all pulling for you! I’m sorry you only had 2 embyros make it. But at least they have been transfered, they’re much better off in you than in a petri dish in a lab. You’ve got to be in it to win it! And this is your month! OMG your fur babies are just beautiful! Poor William, having Tabatha attack from above is probably not going to help his acceptance of her! eek this new fluffy thing can fly! Hi there – de-lurking to wish you all the best. And also to say two four cells on day 2 is where they should be. I have a theory – that the clinics ‘solution’ they grow the embryos in – has a lot to do with how many survive! Can I ask where you are doing your cycle? Ups and down. So sorry it is rough for you. You said that the women in the waiting room would be thinking why are you bothering. I have to tell you I used to sit there and wonder if they were thinking I would just get preg. if I lost some weight. It is hard not to wonder what the other ladies are thinking. But, honestly I never think that type of thing about anyone else. We are all sisters in this struggle! I hope your embies grow and grow! I am keeping you in my prayers and hoping for the best!!! I am in the same boat laying on the accupuncture table crying asking myself “what are You doing?” How many times can you fail and keep going the odds are against you. The Dr. even says ” the succes rate is low.very low” Whatever way this process ends, I must know in my heart of hearts that we tried.we really tried. It is both comforting and sad to know I am not alone. I pray for us all.